Regardless of what type of event you are shooting, be it an auto race, or a child’s baseball game, action photography is a challenging and exciting art to master. Here we will discuss the do’s and dont’s, and what is required of the photographer to capture that perfect broken tackle the moment it happens. First of all, you will need a camera that will actually take the picture very quickly the moment you press the shutter button. Alot of lower end consumer digital cameras may be capable of taking superb looking still pictures, but a long “shutter lag” time will ruin virtually every spur-of-the-moment action shot. digital SLRs are the reigning champions in this regard, as most models release the shutter the instant you push the button. When shopping for a new digital camera, be it a pocket sized camera, a hybrid/super zoom model, or a digital SLR, take careful note of how long this delay is. Another aspect to consider is, how long does the camera take to prepare for the next shot? With most digital SLRs and some ‘hyrbid’ style cameras, you can fire off shots quite rapidly for many shots in succession; not true for most lower end digital cameras, which often have shot-to-shot times exceeding 3 seconds! 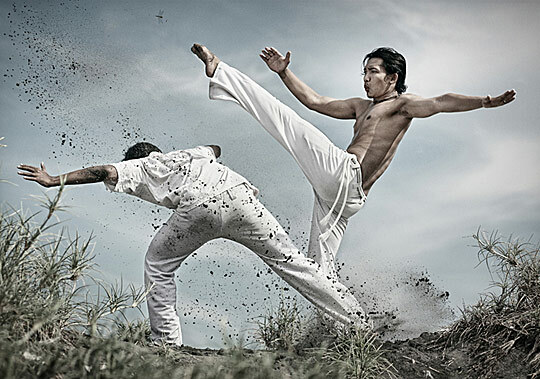 Regardless of what camera you use, you must learn to use it correctly before you can master action photography. When you are getting ready for a shot, press the shutter button on your camera halfway down once the picture is framed the way you like it. This is called “priming the focus”, and dramatically reduces the lag between the button press and the actual shot, since the camera does not have to ‘hunt’ for focus before taking the picture. When choosing the right camera, give thought to exactly what kind of events you will be photographing. Chances are you will need a camera with a long focal length (high zoom) to get close to the action. Choose a camera that has sufficient zoom for your needs, but remember, go only by the ‘optical’ zoom capability of the camera, not the ‘digital’ zoom! If you are going to be shooting often at long zoom from far away, invest in a sturdy tripod. The last, and perhaps the most important factor to consider, is the lighting conditions in which you will be shooting. The less light there is available, the longer it takes for the camera to expose a picture, and the longer the exposure, the more blur will be present in your photos, regardless of the camera you use! If you are going to be shooting action photography in low light, such as an basketball stadium or indoor arena, your best results are going to be from a digital SLR with a quality, ‘fast’ lens. If that is not an option for you, then choose a camera that has a higher ISO sensitivity, such as 3200 or even 6400. A higher ISO setting compensates for low lighting conditions by increasing the camera’s sensitivity to light, thus reducing exposure times and blur. Note that using these settings will cause some graininess and loss of contrast to your photos, but a grainy photo can be better than no photo at all!